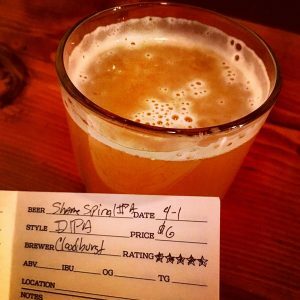 At the beginning of April, I was fortunate enough to be in Seattle for a web designers conference (An Event Apart), so I tacked a couple of days on at each end so I could create my own Seattle beer tour in and around downtown Seattle. My goal for the week I was there was to hit 12 breweries, which is really ambitious for me. Especially considering there were going to be three full days of conference sessions and basically one full day of travel. In the end, the goal of twelve proved too much, but I was able to get ten in. That said, one was a second-location duplicate, but I didn’t realize it until I had to improvise. I thought it would be nice to capture my thoughts about the places I spent time while there, so here is what could be the first in a nine part series, I guess. My hotel, the Edgewater, was, as the name implies, right on the water, so everywhere I went was an uphill hike, but walkng around the city was a great way to find the little holes in the wall shop, like Cloudburst Brewing. Located basically just uphill from my hotel, this cool little place was the first spot I found. The long, narrow taproom was packed that night, as it was one of the nights Gonzaga was in the NCAA tournament. The one television over the bar had the room crowded around it, and while I normally try to avoid the TVs in a brewery I was lucky enough to find a single seat, so who am I to say no to the barstool gods? Phoenix? Do you ever get any rain there? Almost exclusively made up of locals, the other patrons were friendly enough though, especially when they discovered I was from Phoenix. Because that just so happens to be where the tournament was being played. Anyway, back to Cloudburst. 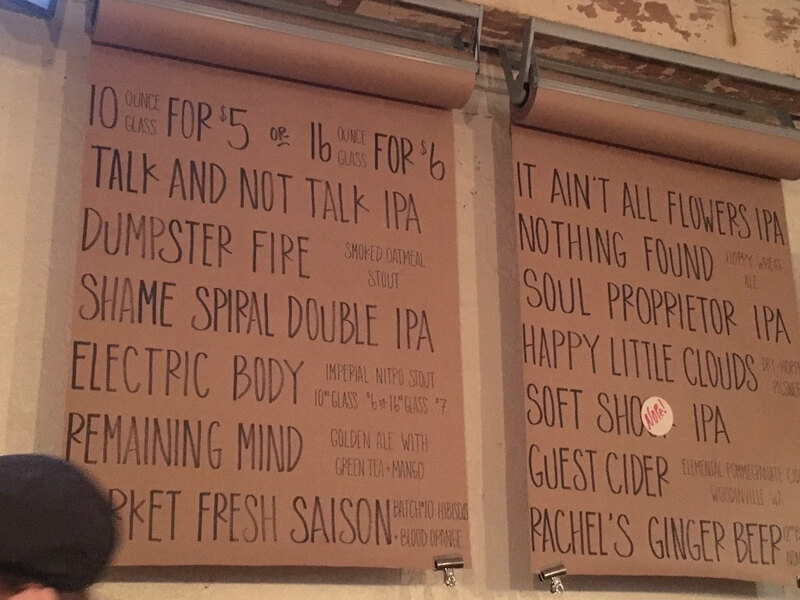 This great little spot loves their IPAs, as evident from their butcher paper menu. I also tried the Dumpster Fire Smoked Oatmeal Stout, and it lives up to its name. At the end of the day, the juicy Shame Spiral Double IPA was my favorite of their fantastically-named offerings. When you find yourself in the Pike’s Place region of Seattle and want to get away from the crowds, just head northwest. You’ll run right into it. Next up in my Seattle Beer Tour session will be Holy Mountain Brewing. Not downtown, but well worth the drive.